I picked up Cal Henderson’s Building Scalable Web Sites the other night hoping to learn something about “The Flickr Way” of building scalable web sites. I’m about halfway through and have mixed feelings so far about its usefulness for my purposes, but I couldn’t help feeling a little thrill when I encountered a reference to Flock on page 142. 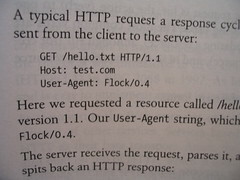 This portion of the book gives a brief explanation of the http request/response life cycle, and Cal happened to be using Flock while generating his example request (which returns a 404, if you’re interested, though the example suggests otherwise 😉 ).